You are currently browsing the category archive for the ‘Article 34’ category. On March 17th 2011, Mr. Joseph Etute detained at the prison of Sandweiler (CPL), received a letter of the Court dated March 9th 2011. The letter was already opened. The applicants complained to the prison officials who apologized. They explained to the Ombudsman of Luxembourg, ECHR ex-Judge Fischbach (1998-2003) that it was their policy to open all large envelope and parcel received by detainees. Under executive order of March 29th 1989 of unelected Grand Duke Jean, the right to correspondence of detainees is severely restricted. Under article 219, convicted detainees require an authorization of the director of the prison to write to anyone other than their family, lawyers, Luxembourg officials (judges, prosecutors, public servants, congressmen and the head of state) and consulate officers. The content of the letters can only be about family and private matters and cannot contain any “allegation” or “accusation” (art. 221). On April 2nd 2011, Mr. Etute filed an application with the ECHR arguing that the opening by prison officials of his correspondence with the Court was a violation of article 8 of the Convention. On May 6th 2011, the applicant received a letter of the Court dated April 11th 2011. The letter was already opened. On June 27th 2011, he received another letter of the Court already open, dated June 17th 2011. 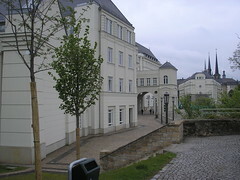 On December 5th 2011, the Court communicated the application to the agent of Grand Duchy of Luxembourg with questions to be answered within 16 weeks. On December 22th 2011, the minister of Justice Bilgen announced a bill on the rights of detainees. But article 31 on the right of correspondence still doesn’t authorize detainees to have a private correspondence with the European Court of Human Rights (see below).